Chameleon Forums - A cute little veiled chameleon gets her picture taken, plays a bit of peek-a-boo in her new home and her owner receives some advice about some slight tail damage that she has due to being housed with other chameleons. 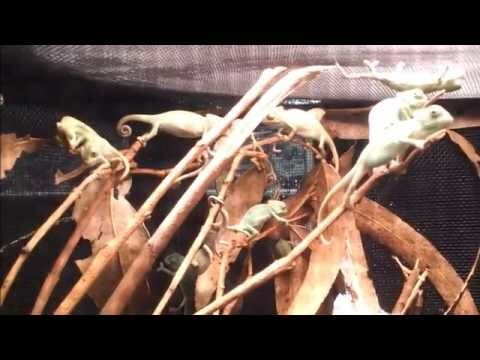 Chameleon Forums - A member receives lots of good advice when they unexpectedly rescue a young veiled chameleon. Chameleon Forums - A member receives lots of good advice when their young veiled chameleon stops eating and becomes very lethargic. Chameleon Forums - A member seeks advice when their veiled chameleon becomes shaky and lies at the bottom of his cage. Chameleon Forums - See some very nice photos of some very cute baby veiled chameleons.